You might have seen this already, when Hellions or Firebats attack enemies nearby trees, these trees start burning down. 1) Open up the Data Editor and go to the Actors Tab. 2) Create a new actor of type Region (Circle), in my example map I have called it SiegeTankBurnTree so I'll go with that. 3) Set Actor - Radius to whatever you want. This'll be the radius in which the trees will be set on fire. 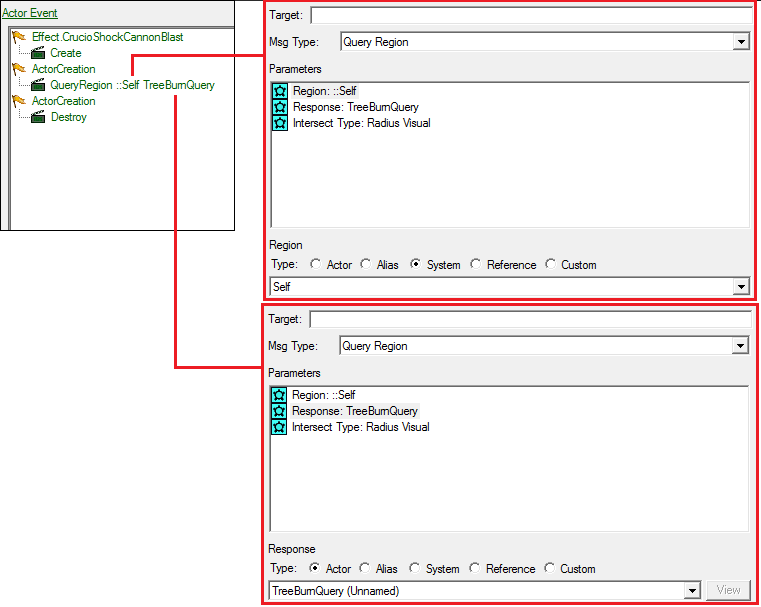 See this image for help on how to set up the QueryRegion message. Of course you can change the first event to any effect (or any other event) you want. The TreeBurnQuery will set everything on fire that Sc2 considers "burnable". I only know of trees. Unfortunately foliage or grass doesn't count as burnable. There might be a few other things that burn down. One way or another, this will only effect doodads and not units. A small example map is attached.